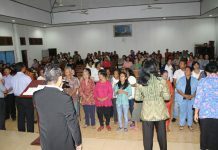 On June 9th, 2017, Praise and Divine Healing Service (KPPI) was held, collaborated with GBI Avenuel Church, Taman Surya, Kalideres, West Jakarta, which is grazed by Rev. Liu Iwan Sawang. The crusade was begun with praise led by Ev. Jolinda Abraham from KPPI team, who invited the congregations to praise and worship God. Continued by airing a healing testimony film of Mrs. Yeni Ambeta whom God healed from a-3-year knee pain at Pray for Palu event. The congregations watched earnestly during the film was being aired. Then the worship leader invited the congregations to worship God. Word of God was given by Rev. Teddy Menas, the KPPI team, who delivered the Word of Luke 8: 22-25 which told of Jesus’ disciples, when they were shaken by the wind, they were terrified. They forgot that there was Lord Jesus who was with them on a boat. The God’s servant said it also happens to our lives, when we have problems, we forget there is a God who is with us. We forget that God is always there and will help us. Our problems seem so great that we do not see that the Lord Jesus who is the greatest, is with us. The servant of God asked the congregations to believe in the Lord Jesus. 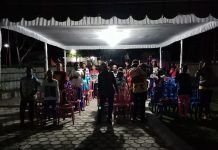 And when the Lord’s servant was inviting the congregations to truly believe in the Lord Jesus as their personal Savior, they welcomed and wanted to really believe in the Lord Jesus. Thank God! Later the servant of God continued delivering the Word of God, about the healing which was taken from Mark 5: 25-34. There was a woman who had bleeding for 12 years. This woman is mentioned had been repeatedly treated by various traditional healers, until she ran out of all her treasures, but there was absolutely no avail. On the contrary, the situation was getting worse. This woman heard the news of Jesus who was able to heal all sickness and she became believer. In the midst of the crowd, this woman approached Jesus, and with her faith she touched the fringe of Jesus’ robe. And at that moment she was healed from her illness. The God’s servant conveyed the congregations to believe in the Lord Jesus, that God is able to heal all the sickness we suffer from as long as we believe in Him. 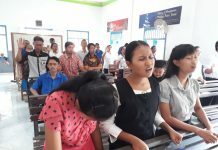 When the servant of God was inviting the sick to come forward to be prayed by the servants of the Lord and counselors, many congregations came forward. There was a woman who was healed from rheumatic pain, also someone whom God recovered from myopic eyes, a woman was cured from chest pain and her bump disappeared too, and there was one healed from a bump behind his ear where previously it was hard, but after being prayed then it became soft. Praise the Lord! All the servants of the Lord and the congregations rejoiced that evening because the Lord has done great things among His beloved people. Hallelujah!